A Go Fund Me account has been set up by friends of the young couple badly injured in a fire at their Purple Sage Court townhouse on Tuesday. 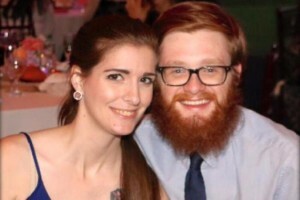 Liz and Tyler — friends asked that their last names not be used for privacy reasons — continue to recover at Medstar Washington Hospital Center. The couple, unconscious from smoke inhalation, was carried from their second-floor bedroom by Fairfax County Fire and Rescue firefighters after fire broke out on the first floor of the townhouse about 6:30 a.m Tuesday. Investigators are still trying to determine how the fire started. Friends say much of their household possessions and necessities were lost in the fire. Liz and Tyler’s two dogs and two cats died in the fire. Firefighters were able to rescue a pet bird. The couple will celebrate its first wedding anniversary on Oct. 24. “They are two truly amazing, loving, caring, humorous (and so much more) individuals who did not deserve any of this,” wrote Stephanie Twombly, the friend who started the Go Fund Me account.